I started this blog 2 years ago today, really as a sort of diary for myself to chronicle my sewing and knitting activity and somewhere to put all the photos of the things I make. It has been great fun and I cannot believe over 31.000 people have read it in the last two years. I love my little piece of this world here in Suffolk UK. 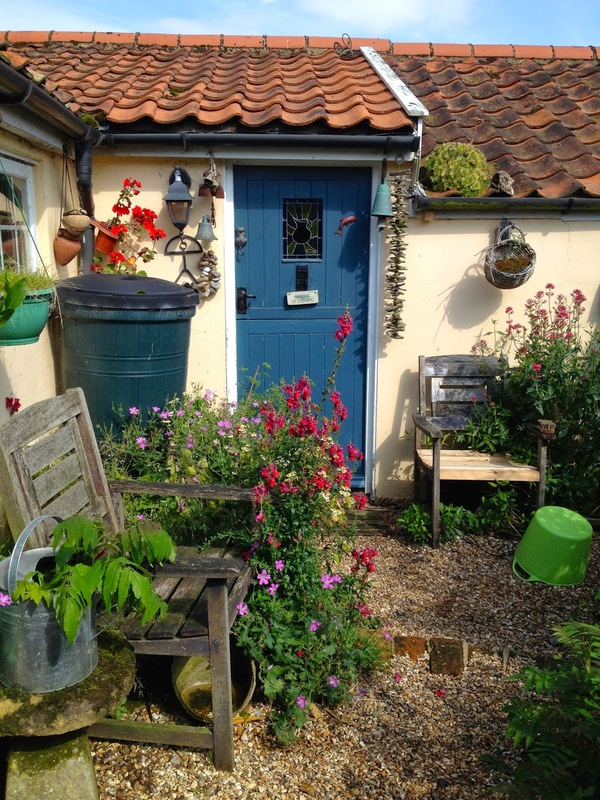 My little flint cottage, which was built in the seventeen hundreds, and my ever changing garden. Which with the help of the birds and him above seems to take care of itself, with a little tweaking from me. I have been away for a mini break with my grandchildren and son and daughter-law. We have been visiting lots of places near to where we used to live 40 years ago. Some were good some not so.. but a great time was had. Now no sewing or knitting has been done so I have nothing to show. 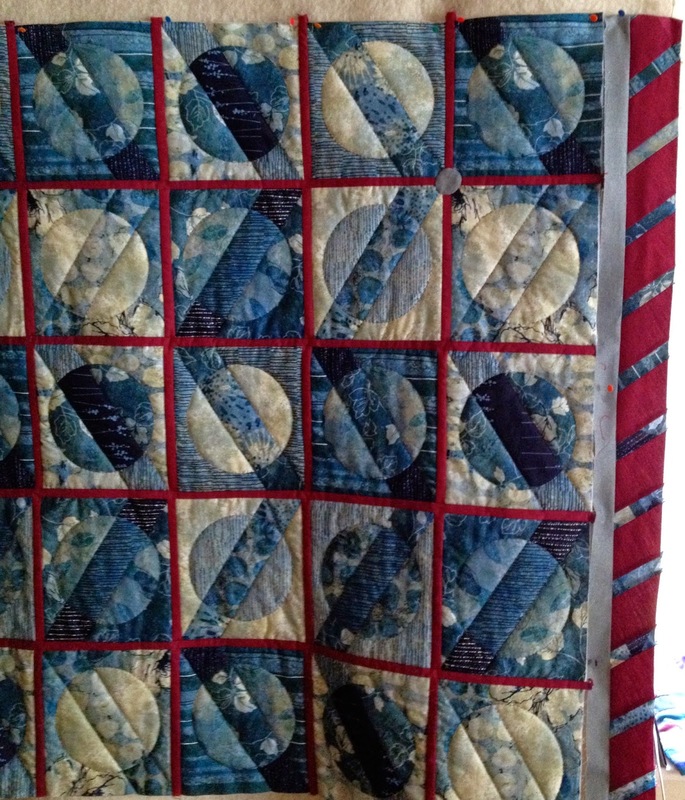 Not even finished the Lunar Quilt. So to celebrate the birthday a little giveaway. I hope you remember the little orphan block that I did not use in the Mystery BOM. Drawing of block.on A4 paper. 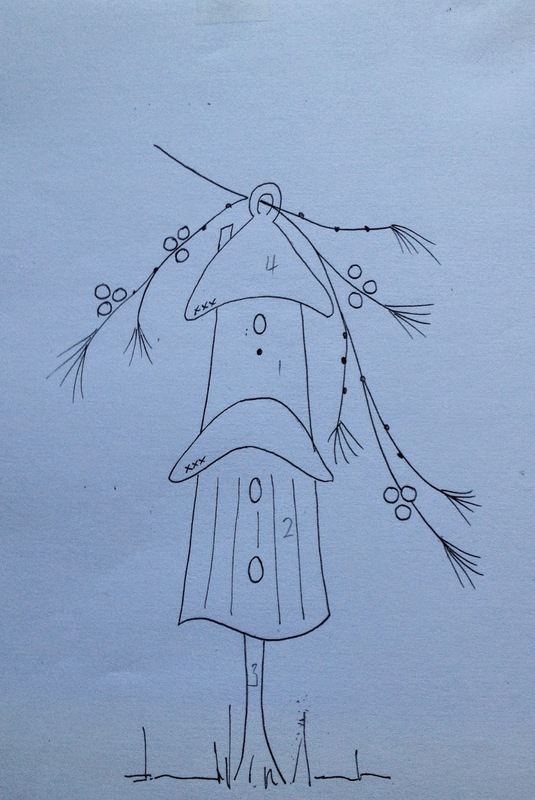 Please feel free to copy the drawing, and if you would like me to send you the finished block please leave a comment at the bottom and tell me why you would like it.. If I do not get any comments ( as I do not get that many)then I shall turn it into a cushion. 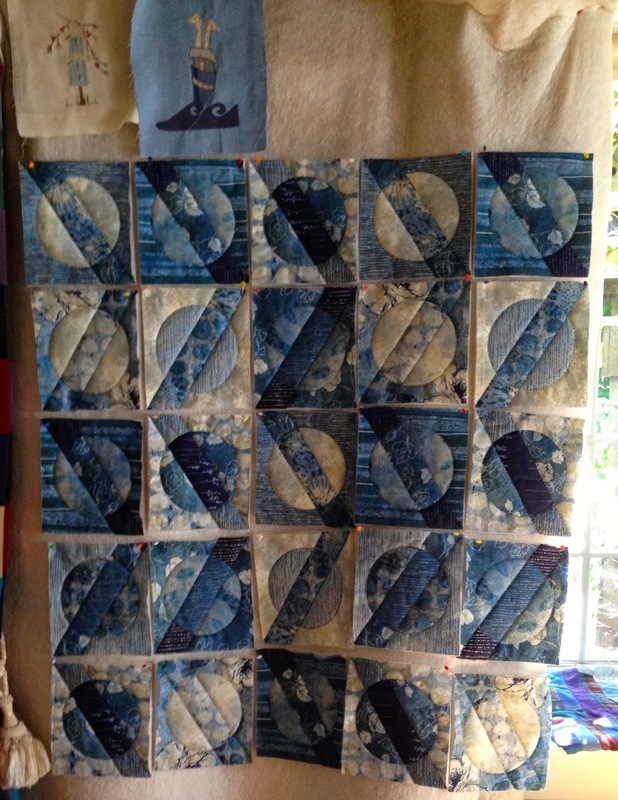 This Blog is mainly pictures of how this quilt is going so far. As you know, I bought this abstract panel plus an extra half which was all they had. So I cut it all up, and thank goodness I had taken the photo of the panel. Little quilt sandwiches were made of each block and were hand quilted , using a very high loft wadding. All positioned again( so thankful for the panel photo) on the design wall. Now for the sashing, using a shot fabric (blue one way and red the other) One inch wide, finished width half inch. Some of the joins are not quite perfect, so a little round of fabric might be needed to be appliquéd on over the joins. :0)) The sashing fabric frays terribly so does not lend itself to being unpicked very much. All the sashing finished, and now on to the borders. The border reminds me of Mr M's R.A.F. tie so perhaps he will end up with this quilt. 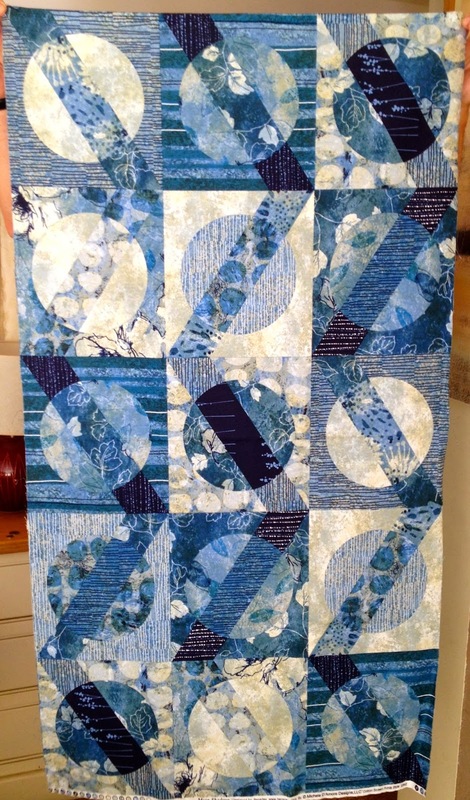 I have nearly used up every scrap of the fabric for this quilt and as yet I still have to bind it. So it's a case of find something in my stash or another trip to my favourite quilt store. 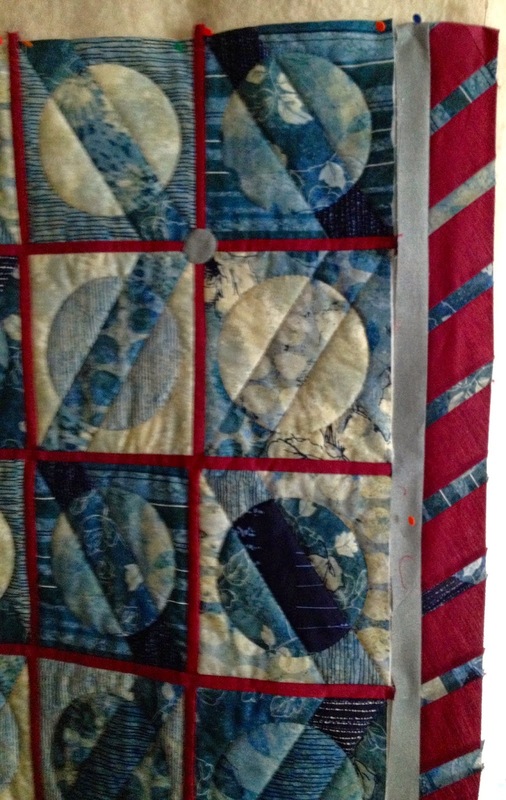 I have been looking at the quilt hanging on the design wall this morning and have decided that the borders do not work. The quilt is just about big enough for a lap quilt or a wall hanging. so am about to make the borders into binding. 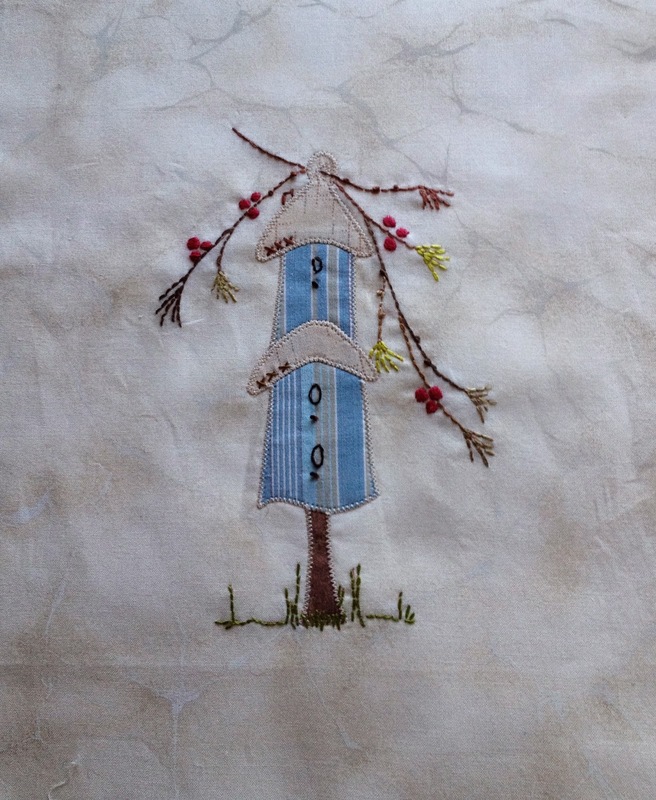 I have reversed my BOM list this month and put the appliqué first. Partly because Wimbledon has been on the telly, and having finished my mystery Afghan ( I usually knit and watch the telly) I needed some hand sewing. 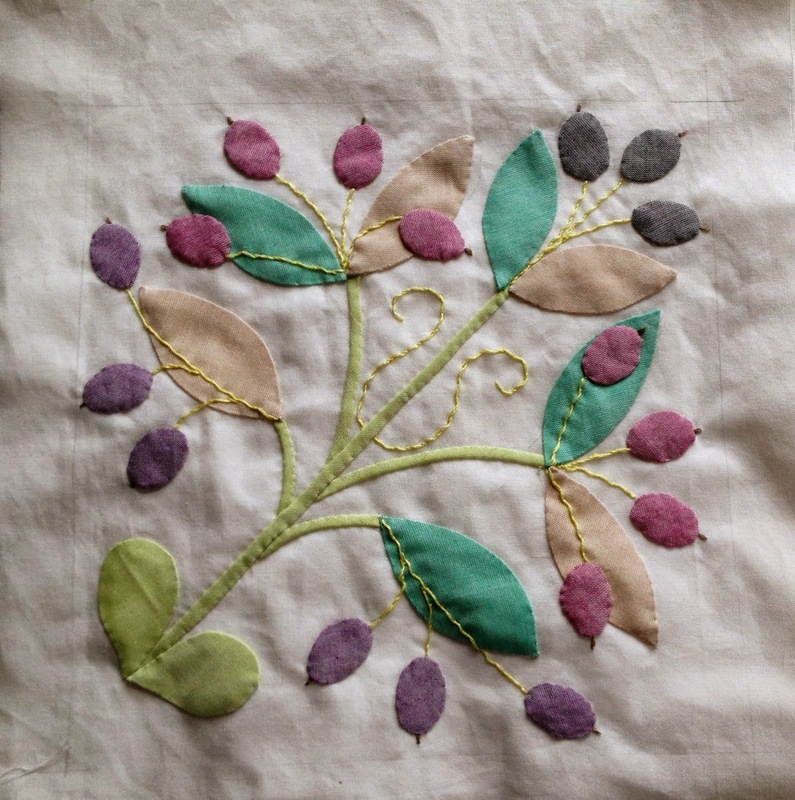 The middle nine blocks are finished though not stitched together, and this months it is the four corner Olive trees. Two down, two to go, they are very like the first centre block we did in month one. One of the four corners. I must admit they are far easer than that first block. That was a drastic learning curve for me. 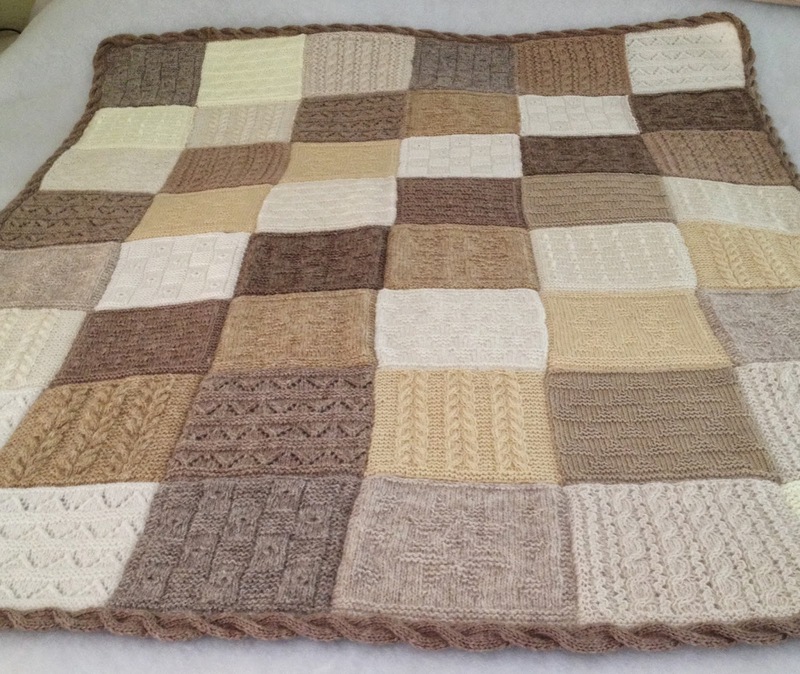 Very pleased with the Rowan Mystery Afghan, although I did not use the colours they suggested and I did mine in 4ply rather than DK, so it is slightly smaller. Mine measures 50" x 40". The pesky rope around the edge seemed to take forever, probably due to the world cup football being so exciting. I would like to knit another in shades of grey and white. These are going to be great as lap quilts in the winter. Also my wool stash is going down fast, possibly might need to buy some more!!! Hope to finish the other two appliqué corners today. Keep safe and keep stitching .................Doti..